Posted on June 26, 2015 by Lisa Johnson, Ph.D. There are many models for instructional design (ID). It will be up to you as a motivated learner of the art and science of instructional design to seek out information about models. There is a tremendous amount of information available online to consider. This post presents places to begin exploring and poses a question for you to consider about the ADDIE Model and whether components are the essence of all ID models. One option to use for learning about ID models is a Google Images search for “Instructional Design Models” – from there, you can click on any model’s image and select its “view page” option to see the webpage where the image appears and, in most instances, learn more about the model or just search the name of the model to learn more from a wider variety of websites. You could also begin by exploring some of the more popular models in instructional design detailed on this Instructional Design Models page from Cullatta (2013) or this Instructional Design Models page from Ryder (2014). Regardless of their nuances, all design models involve five essential tasks for the designer, which are reflected in one of the oldest instructional design models, the ADDIE Model (i.e., Analysis, Design, Development, Implementation, and Evaluation). 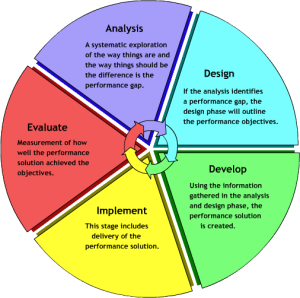 The image with this post of the ADDIE Model is from the CSUChuco.Edu website; it illustrates how the model is an iterative model wherein each aspect of the model occurs interdependently with the others. 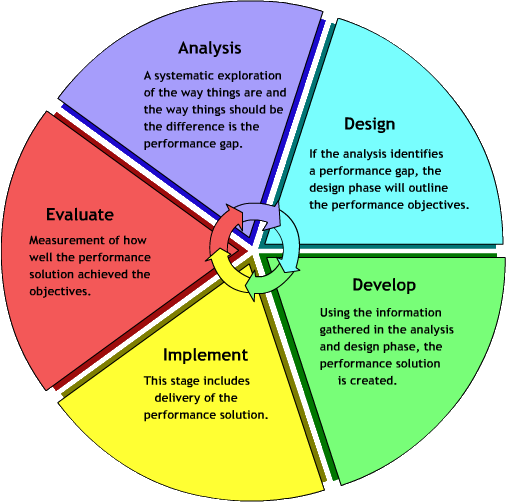 Although each aspect occurs in a linear process overall, the aspects of the ADDIE Model simultaneously occur in a non-linear process (i.e., analysis, evaluation, and design naturally occur in some form during development and implementation). This is one reason I like to call the ADDIE model the “Chi” of all design models. Would you agree with that assertion? Why/Why not? Please comment on this post with your response! This entry was posted in Educational, Scholarship and tagged Instructional Design, Instructional Design Models by Lisa Johnson, Ph.D.. Bookmark the permalink.